Welcome to part II of our mask series! As we discussed in our last post, we’re advocating some simplification of costumes this year. We think masks are a great statement piece. When you’re wearing a good mask, the rest of your costume often fades into the abyss. This isn’t to say we don’t believe in a good mask AND a good costume, but more that we think it’s time to start considering the mask as the starting point and the clothing as just a means to an end. 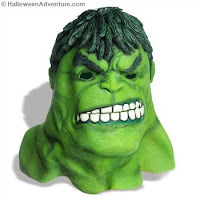 Celebrate a man of power (no, we don’t mean a politician) with our Hulk Adult Mask. A full over the head green latex adult mask with eye holes. This is an officially licensed product from, THE HULK Movie. Slight variations are a part of the process and help to make each of the masks a one-of-a-kind collectable. 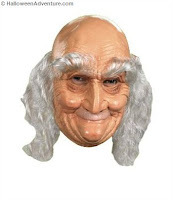 Try out the other end of the age spectrum with our Old Man Mask. This mask would go perfectly with some of grandpa’s clothes and perhaps even a walker. Remember, this might be you some day, so you might as well get used to it now! Mimic a scary Russian wizard with our Rasputin Mask. 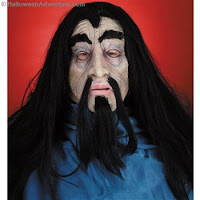 This high-quality latex mask with attached hair will have fellow partygoers fascinated with your unique and original costume selection. This baby is frightening, freaky and totally fabulous, with its long hair and crazy skin tone. Were you one of the many who loved the horror flick Saw? If so, recreate the characters with our Saw Pig Mask, and Saw Puppet Mask. We didn’t see this movie (we were too frightened), so we’ll probably avoid you if we see you roaming the neighborhood, but don’t take it personally! Ahhhnolldd! 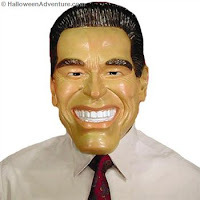 Imitate this actor turned California politico with our Arnold Schwarzenegger Mask, a delightful pull over face made of soft vinyl that gets the Terminator’s bushy eyebrows and wide smile perfectly. Ogres are like onions! They’ve got many layers! 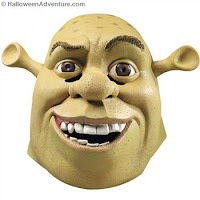 Peel away the layers and reveal this fabulous Shrek Mask, straight out of the well-loved movie. Head over to our costume section and check out our Shrek Costume to go with it! For many more masks and costume ideas, visit our mask section at Halloween Adventures!